He celebrated the "humiliation of the Ontario Liberal Party." 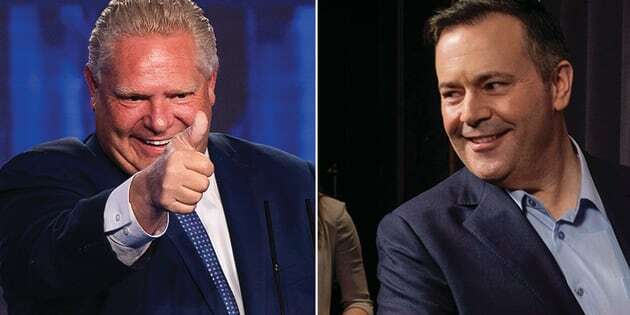 Incoming Ontario premier Doug Ford and Alberta's United Conservative Party Leader Jason Kenney. A majority win for Doug Ford in Canada's largest province is "good news for Alberta," Jason Kenney says. The leader of Alberta's United Conservative Party released a statement Thursday lauding Ford's victory in the Ontario election, setting up a fight with Prime Minister Justin Trudeau over the federal government's plan to impose a national price on carbon pollution next year. Ford has promised to scrap Ontario's cap-and-trade program and fight the Trudeau government, tooth and nail, if they move to impose a carbon tax on the province. However, he did not explain throughout the campaign how he might recoup the money the cap-and-trade program brings into government coffers, which amounted to roughly $2 billion last year. Kenney, who hopes to win government in Alberta next year, is pledging to repeal that province's carbon tax. Saskatchewan Premier Scott Moe has launched a court reference to see if the feds have the constitutional right to impose a carbon price on provinces. "The Ontario PCs are strongly committed to fighting Justin Trudeau's Federal carbon tax, and joining a future Alberta government in defending Canada's resource industries," Kenney said in his statement. "Today's humiliation of the Ontario Liberal Party is a massive repudiation of the failed energy policies now being pursued by Alberta's NDP. Ontarians have said loud and clear that they reject policies that have led to higher taxes and high energy bills." Kenney, who was as a senior federal cabinet minister in the former Conservative government and recently apologized for public swipes at Prime Minister Justin Trudeau's intelligence, said he looks forward to working with Ford to "fight for working people against the Trudeau carbon tax agenda." The UCP leader also released a video on social media of Ford railing against the carbon tax at different points in the PC leadership campaign. "Glad to have another ally in the fight against Trudeau's carbon tax agenda," he wrote. Though Ford often took shots at Trudeau in his stump speeches on the campaign trail, he did not mention the prime minister in his address to jubilant supporters in Toronto Thursday. He also did not touch on a looming scrap with Ottawa on carbon pricing. Trudeau released a statement congratulating Ford on his win and pointed to potential areas of agreement. "I look forward to working with the new provincial government to create good, middle class jobs, make Ontario a world-leading centre for innovative and sustainable technologies, and build infrastructure that meets the needs of Ontarians," Trudeau said. "Together, we will continue to work to grow Ontario's economy and address issues of importance to Ontarians and all Canadians." Trudeau also thanked outgoing Ontario premier Kathleen Wynne, perhaps his closest provincial ally, for her "years of service."